Zara Clutch. Cheap Monday Sunnies. LEO. I don’t know what it is with me and leopard print but I never seem to get tired of it. Got this baby at Zara the other day and I’m pretty sure it’s actually meant to be a wallet but I’m planning to use it as a small clutch, perfect to spice up a simple outfit! Very cute~ Can’t go wrong with leopard print! I love the sunnies as well. Oh thats really cool clutch! I have a love for leopard print too. It’s timeless. love this! I have this clutch in bright pink, my mom said it’s supposed to be a small wallet but I totally use it as a small clutch. Love it! It will be perfect with a black shirt. The feline print clutch is adorable! Leo is my FAVORITE color :D Goes with anything and everything…awesome buy! AH i love them both! The perfect clutch! I love Zara! Nice. 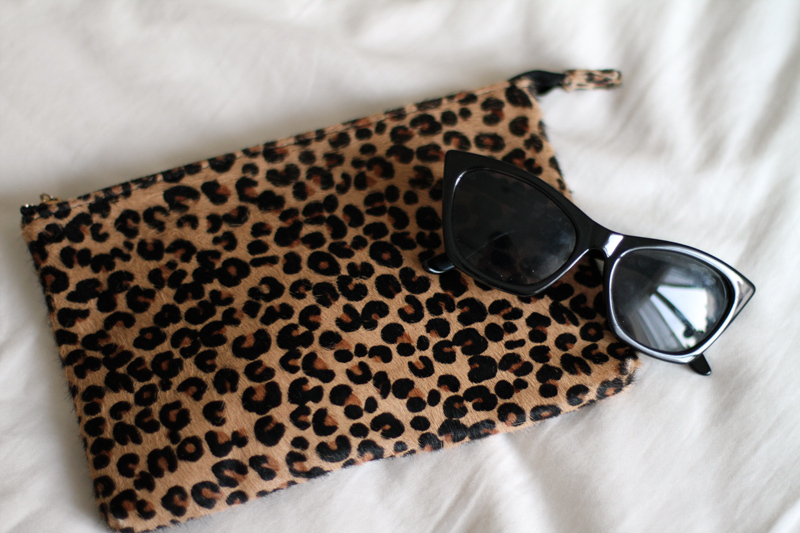 Gorgeous clutch and cool sunnies ! Funny ! 2 days ago, i bought a Zara clutch as well, it’s leopard too, but half leopard and half suede ! and a pair of Square Wavefarer !!! Love this basic. I need to get to Zara soon! There is no such a gorgeous clutch in my closer Zara :( Am going to wait and see. I read too quickly and thought you said that the purse was from baby Zara and thought, wow, I guess the Zara baby is as stylish as the Zara woman… maybe I should check that section out next time and see what they’ve got. NEVER MIND. Nice sunglasses, btw. Oh it’s so nice :) I love leopard print things! JEALOUS JEALOUS I AM !! VERY COOL CLUTCH! i love it! definately gonna keep and eye out for it. i love it! definately gonna keep and eye out for it. can’t wait to see you style it. love it :) its very cute as a clutch!! dandy pieces! love the print and the cateye! it’s simple and small, but it’s perfect somehow. i love animal print! this is perfect! I can’t wait to see this clutch with whole outfit!!! I am a leopard print fiend! I love those sunglasses! I’m not a big fan of those cat eyes, really cool on everybody but me, but I sure can fancy those! nice clutch did you see the blazer as well at Zara amazing in leo like this ! Loooooooooooooooooove. All I can say. omg i love it, i just picked up a leapoard print ipad case but i sport it as a clutch too! im also a stylist let connect !